All SCUBA Programs Taught to NAUI or PADI Standards! LEARNING TO DIVE IN THE 21st CENTURY: Today with the Self Study eLearning, we take a new approach to your dive education needs. When you sign up for a class you must select your certifing agency, NAUI or PADI. Then you will go home to begin your online eLearning knowing you can call us at any time if you need help. You then return to purchase your mask, fins, and snorkel. Once you complete your studies and take your final exam you can schedule your pool session. We always want those who have completed their studies in the pool because they will have the best learning experience with the prior knowledge under their belt. When the academics and pool sessions are complete the studen then chooses how/where they will do their open water dives. OVERVIEW: Scuba Diver is the entry level scuba certification course. It provides the fundamental knowledge and skills to scuba dive. Upon successful completion of this course, graduates are considered competent to engage in open water diving activities without supervision, provided the diving activities and the areas dived approximate those of training. You must also be accompanied by an equally or higher trained buddy. OPEN WATER DIVES: The minimum number of open water dives is four. They must be all scuba dives and one skin dive may also be added. No more than three scuba dives may be made on a single day during the course. Open water training may be completed in two days with a skin dive and two scuba dives on one day and two additional scuba dives on the other day. All open water training must take place during daylight hours. Sixty feet (18 m) is the maximum depth for any open water training dives during the course. These dives must be completed within six months of the end of the class. ONLINE LEARNING AVAILABLE:Now you do all of your academics online wherever you have an internet connection! Once you are setup to access the online studies you have lifetime access so refreshers are always just a click away. MORE IMPORTANT INFORMATION:Unless specified otherwise our Scuba courses meets weekday evenings or Sundays for pool sessions. All online eLearning must be completed prior to attending the pool sessions. 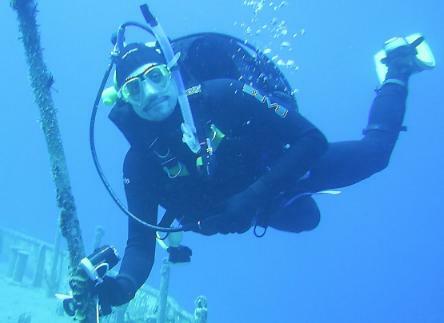 CERTIFICATION: Upon successful completion of the course and the openwater checkout dives ( not included in the course fee ), the student will receive an internationally recognized Scuba certification. The open water dives can be done locally during the summer aboard the Silver Dolphin or on an optional Florida or tropical trip. (Complete Referral Packages are availablefor $75) Class size is limited to eight! FEES: The course fee of $395 (May be more in some locations) includes books and home study videos, syllabus, facility fees, and the use of all Scuba equipment for the pool. Available online study systems are an additional $99.95 for NAUI and $199.95 for PADI. You will also get a free subscription Dive Training Magazine. The student must provide their own Scuba quality mask, fins, and snorkel. These items must not be purchased prior to completion of the first three chapters of the studies. New classes start every week! Study Online or with Award Winning Education systems! Now you study at home or on the road with NAUI's or PADI's newest self paced study system. You can avoid spending up to ten hours in the classroom environment. eLearning is available in several languages. The student will also receive a complimentary issue of 'Diver Training' magazine. You will be required to attend pool sessions and pass the SCUBA Diver onlinewritten examination. Once you have completed the Pool and academic requirements you will be ready for the openwater phase of your training. The cost of the openwater qualification dives is not included because there are three diffrent options available.